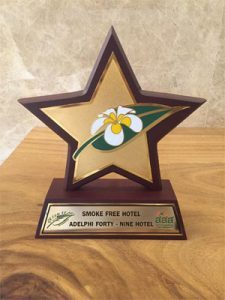 Adelphi Forty-Nine Hotel recognizes the importance of environmental management, as the issue of saving the environment involves every sector whether it is our guests, team members, surrounding communities or the world. 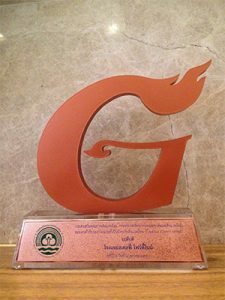 This is to support our goals of collaboration to maintain the environment and reduce global warming. The company is determined to organize activities that help to protect the environment and promote working with nature, related services and information, by mainly considering the environmental impact and the convenience of guests, as well as continually improving work procedures for environmental protection and to reduce non-renewable energy consumption. In-room electrical system controlled by keycard system. Cleaning the duct air filters and air grilles every 6 months as a minimum. Preventive Maintenance Program for cleaning the air conditioners to increase the efficiency of energy consumption. Refrigerator in every guest room is set at the proper temperature. Use of energy-saving light bulbs in every area of the hotel. Set goals to decrease the energy consumption of using electricity. Install timers for lighting and other electrical systems. Lighting in some areas are turned off during the nighttime and daytime when there is light. Hot water in the guest room is produced from the heat exchanger system. 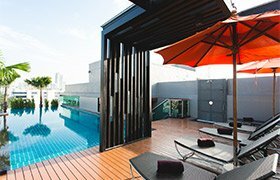 The hours for some services, such as the swimming pool, are arranged and adjusted to reduce use. Electricity in the gym will only be turned on when there are users. The energy-saving measures are applied to the internal management section as well. We use salt water system for swimming pool. Reducing the amount of water used for cleaning toilets and other areas. Regularly checking for water leakage. Campaign for team members to avoid leaving faucets on while washing food. Maintain daily record on the use of water (control the daily water usage). Notify water use levels to team members, especially in summer. Choose to grow plants that need a small amount of water. Only water the garden in the morning and evening to prevent water evaporation during the hottest time of the day. Wastewater (water from showering, water used for cleaning, water from the toilets, water from the swimming pool and water from the ponds, etc.) will enter the wastewater treatment process before discharging into the environment. Use of Sequencing Batch Reactor (bacteria) for the wastewater treatment system. All waste is appropriately sorted by type: wet waste, dry waste, recyclable / toxic waste (batteries, light bulbs, chemicals, etc.). Campaign for the guests to turn their engines off while parking to reduce noise and air pollution, as well as save fuel. Encourage guests to take part by requesting to use the same bed linens and towels, to save water, labor and chemicals used in the washing process. Use eco-friendly cleaning products and eco-friendly chemical products only. Use liquid to clean the floors and fertilizers that are made from biodegradable natural raw materials. Use organic fruits, vegetables and flowers. No chemicals used in the planting of trees and flowers in the hotel. Choose a pest control company which uses chemicals that do not harm humans and the environment. Sorting and sales of paper bottles and cardboards to recycling companies. Reuse the flowers as much as possible. A reuse system for the use of paper. Aluminum bottle caps are collected for donation for prosthetic legs. Purchasing or supplying products and services with minimal environmental impact. Purchase local and seasonal products to decrease transportation demands and effects to the environment. Organize activities and encourage team members to conserve and protect the environment. Food and gift donations to underprivileged children on the anniversary of the hotel or other occasions on an annual basis. Implement a monthly cleaning day and cleaning nearby communities. Team members use recycled paper and envelopes. Team members use energy-saving light bulbs. Team members use computers and emails to reduce paper usage. Actively support all green projects and create good examples for all employees. Team members reduce the need for printing and photocopying. Campaign for team members to walk up the stairs instead of using lifts. Campaign for team members to close the windows and doors while air conditioners are on. Campaign for team members to turn off the air conditioners, lights and electrical equipment after leaving the office. Campaign to switch off computer screens after work and during lunch break. Available information board to encourage water and energy saving. Organize team member training on topics of energy conservation (e.g. turning off lights, computers, water, air conditioners and other electrical equipment). Training program to educate team members about environmentally friendly projects. 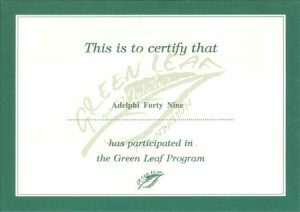 Appoint a Green Committee Board with representatives from every department and hold monthly meetings to motivate team members to be aware, reduce energy consumption, and be environmentally responsible.